MIAMI (AP) Aaron Judge’s victory in the All-Star Home Run Derby drew the event’s most viewers in nearly a decade. The slugfest Monday night was seen by 8.69 million viewers on ESPN, ESPN2, ESPN Deportes and the company’s livesteams. That was up 55 percent from last year’s 5.62 million, the most since 2008’s 9.12 million and the second-most since 1999’s 8.91 million. The derby got a 10.8 rating in New York, the highest since market records began in 1998. With Mike Moustakas of the Royals among the eight sluggers in the contest, it drew a 13.6 rating in Kansas City, the largest among metered markets. Asked whether he thought of himself as the next Babe Ruth, Judge demurred. ”No. I think of myself as a little kid from Linden, California, getting to live a dream right now,” he said before Tuesday night’s All-Star Game. Judge hit 47 home runs in the derby that totaled 3.9 miles, including four drives of over 500 feet. 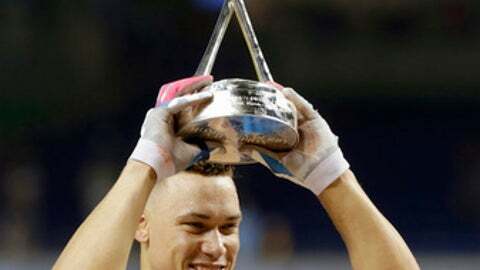 He also hit the Marlins Park roof, about 160 feet above the field. The rookie right fielder for the New York Yankees leads the major leagues with 30 home runs. Manfred said the Home Run Derby is different for players than the day to day of the season. Associated Press Writer Tony Musto contributed to this report.